You can add your products to Countr one by one, or you can use our importing feature to add products in one list. If you switched from another platform to Countr, importing is the simplest way. Add your products to the file. Please ensure that you have filled all the mandatory field, otherwise the CSV will not import. Note: if you are updating your existing items, you may want to start by exporting your products instead. This way, your CSV file will have each item's Product Id, Tax Id, and Category Id. How do I fill the CSV template? In our pre-made template, row 2 - 13 provide instructions on how to use the template. You can leave the rows there or delete them. Deleting the rows will not have any effect on your import. However, you must keep all columns and headers the same. If you delete a column or change a header name, the system will not recognise the template upon import. 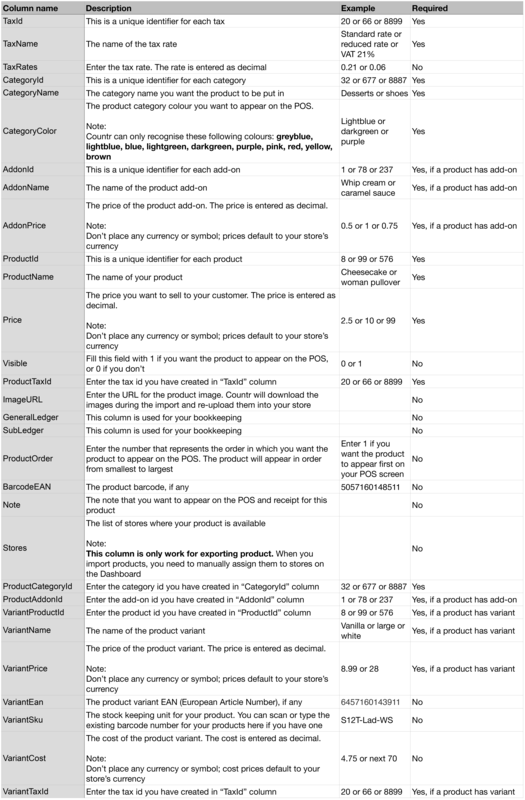 The following table gives you more information on how to fill the data in each column (click the image to zoom in). Make sure you don't save the file in the default file format of the application you're using. The file needs to be saved in .csv format. During the import, our system will run a quick check to make sure your CSV's columns match. It will also check for any formatting issues or errors such as mandatory fields and column headings. If Countr detects any errors, you will see detailed information about the error and any corrective actions you need to take before relaunching an import. Once you've made the required changes, reimport your CSV file. If you're still unable to upload the file correctly, please contact our support team.